Manjuyod Sandbar is a paradise known as "The Maldives of the Philippines" and appears at the sight with its magic sand bar when the tide comes down. The best period to travel here, like in the rest of the Philippines, it's from December to April. In order to get to Manjuyod you will have to fly till Dumaguete. A flight from Manila takes about 3 hours and a half and costs about 70 USD with the local airlines Cebu Pacific or Philippine Airlines. From the airport of Dumaguete you can take a tricycle to the Ceres Bus Terminal, where you can take a bus directed to Bais for about 55 PHP (a bit more than 1 USD) and get off at the Barnagay Calindagan. From Bais City you can take a tricycle to Canibol Wharf or to Capiñahan Wharf, where you can rent a boat for Majuyod at 3,700 PHP (about 70 USD). The price is for a transport service for 10 persons and it's a whole day rental that includes boat tour to Manjuyod Sandbar, Bais City Bird Sanctuary and the Mangrove Forest. Considering the low availability, we suggest to contact us in advance. Once you have booked the cottage you will be looking forward to be in this paradise. Renting a cottage costs 5,000 PHP for daytime use. The overnight rate is 5,000 PHP, and 24-hour is 9,000 PHP. Please keep in mind that on the island there are no restaurants or other services that you could expect in a tourist destination. 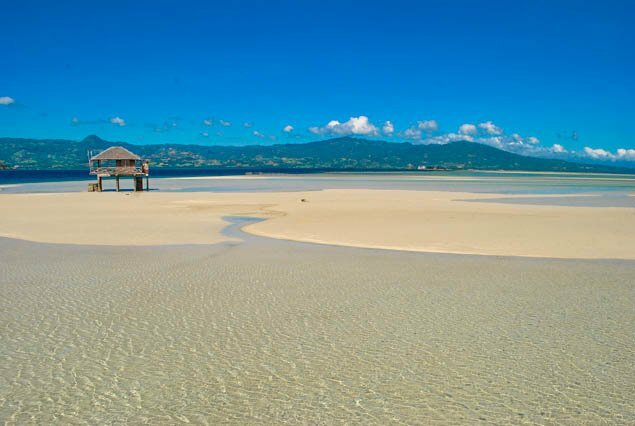 Manjuyod Sandbar is a wild nature paradise, if you are planning to spend the night there, make sure you bring with you enough food and water, but also flashlights and spry anti mosquitos.